Ann Arbor, MI – June 13, 2009 – Members of Lower Michigan’s community of whitewater kayakers gathered at the Huron River on Saturday to paddle the free-flowing waters of the Huron River between the Delhi Metropark and the bridge crossing near the intersection of Huron River Drive and Tubbs Road. 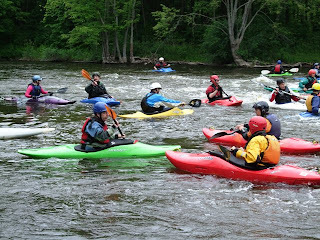 The demonstration was intended to raise awareness of the Huron River’s value to whitewater kayakers and to highlight the potential for new whitewater resources in the event that Ann Arbor’s Argo Dam is removed. Whitewater kayakers have been using the Huron River to train, practice, and teach the basics of the sport for over 40 years. 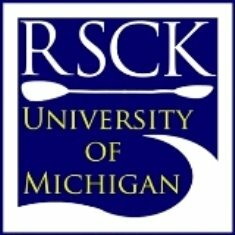 The local kayaking group—the Raw Strength & Courage Kayakers (RSCK), a part of the U of M’s Rec Sports program—introduces 200 new individuals to the sport of kayaking each year. Winter training takes place in the pool at the North Campus Recreation Building and includes both students and community members. Spring is the season of introducing new paddlers to the flowing waters of the Huron River, while summer and fall are months where paddlers drive hundreds of miles to enjoy the free-flowing rivers of Western Pennsylvania and beyond. Kayaking groups that use the Huron River exist in Ypsilanti, Rochester, Lansing, Flint, Windsor, and Toledo. 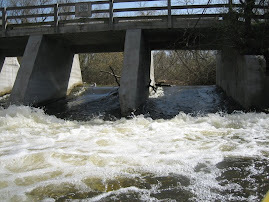 According to former RSCK President and U of M student, Bryan Toth, “Paddlers all over Michigan would happily flock to a single, high-quality whitewater feature.” The potential to create a whitewater feature such as a standing wave or hydraulic could exist if Argo Dam is removed. Argo Pond occurs along one of the steepest drops of the entire Huron River watershed. The projected 30 acres of parkland the City of Ann Arbor hopes to gain would allow for greater access to the river, as well as a forum for whitewater kayakers to demonstrate their sport to the public. Toth has paddled engineered whitewater parks on Western Rivers like the Arkansas River in Salida, Colorado. The Salida Whitewater Park is the result of a partnership between the City of Salida and the Arkansas River Trust. Similar collaborations to create new whitewater resources exist in Rochester, New York; Wassau, Wisconsin; Des Moines, Iowa; and South Bend, Indiana. 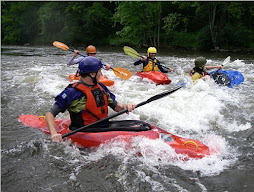 Whitewater kayaking is a tradition on the Huron River in Ann Arbor. Removing Argo Dam could create a unique new recreational resource in the form of aesthetically-pleasing whitewater features.